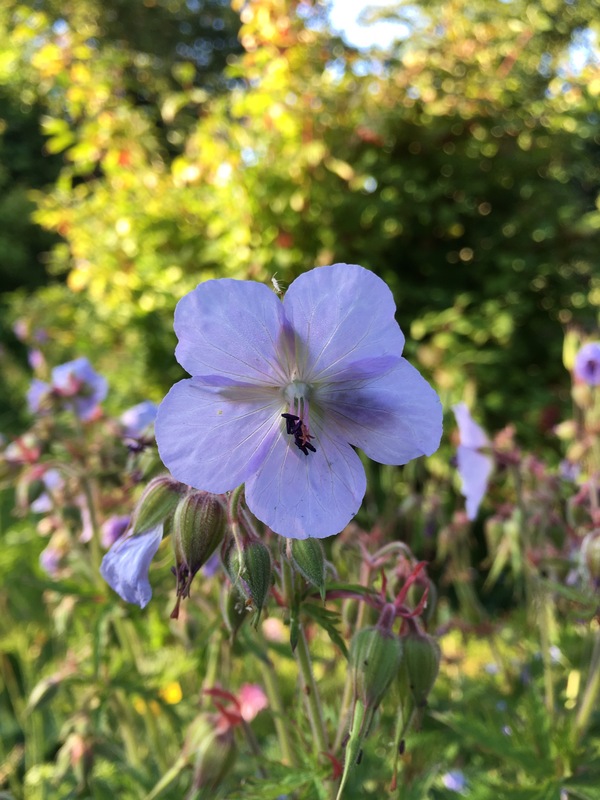 #wordlesswednesday- wild geraniums on the march. Wild geraniums billow in the long grass on the lane outside my house. Back lit, they look like mini- stained glass windows. This pretty white seedling turned up on its own- probably a hybrid with one of my garden plants. I am thanking the bees for this little beauty. The common name, cranesbill, comes from the shape of the seedhead which resembles the long tapering beak of a bird. 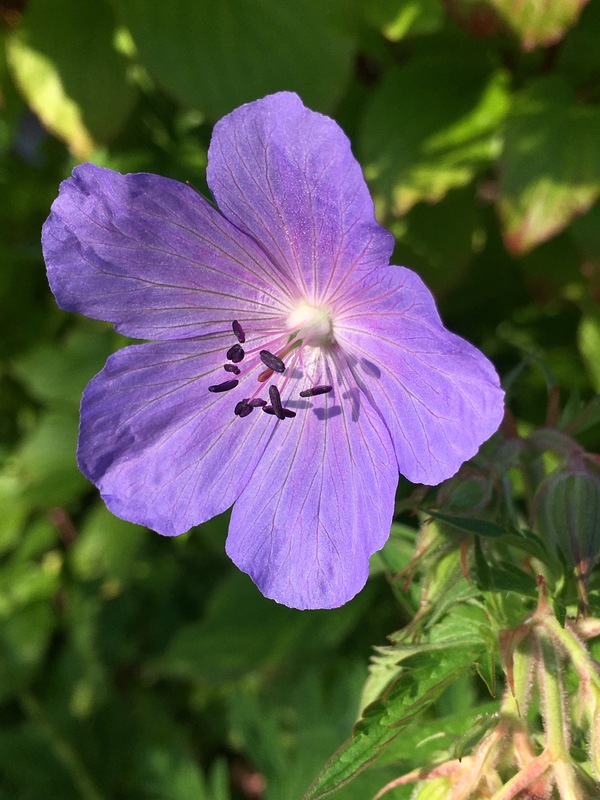 Meadow cranesbill, or Geranium pratense, comes in a range of colours from white to deep blue. I love the violet-blue veins and the dark plum anthers. The flowers glisten in the sun as if they’ve been coated in sugar. A favourite of mine is this pale violet flower with delicate silver veins. I ought to be getting on with my work, but I spend more time than I should just gazing at these beauties, comparing their hues and pondering on the wonders of nature. And luckily for me, these gorgeous plants have drifted in through the front gate and settled in the garden- all along the path to my front door. It’s a wonderful welcome home- and I haven’t done a thing to create it. It’s happened all on its own. Isn’t nature grand. I’ve found a beautiful violet form called Beth Chatto on the RHS website. Click on the highlighted word to find out more. Geraniums can be grown from seed. Flowers appear from June to September and plants grow to about 70cm in sun or slight shade. Perfect for grass meadows- or you can plant in drifts in amongst shrubs and perennials. Highlighted in the RHS Perfect for Pollinators list. 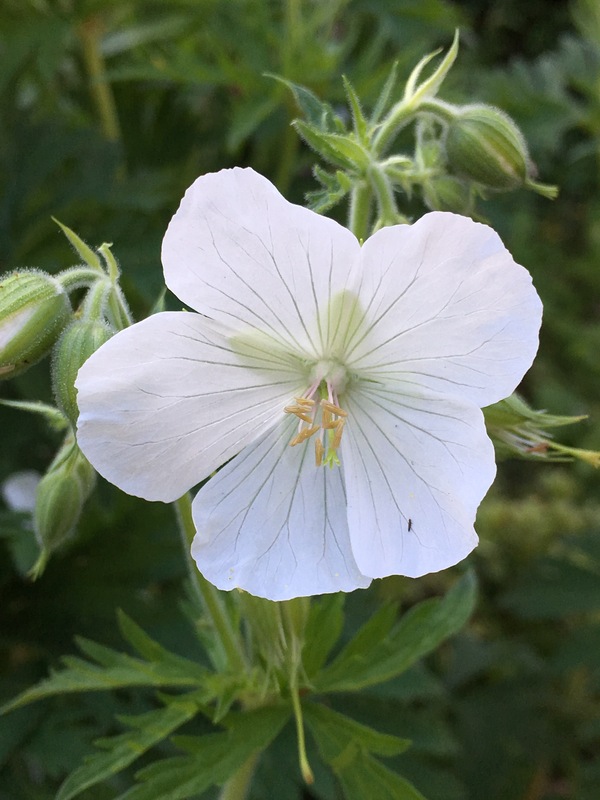 Bees and butterflies will certainly thank you for planting geraniums. 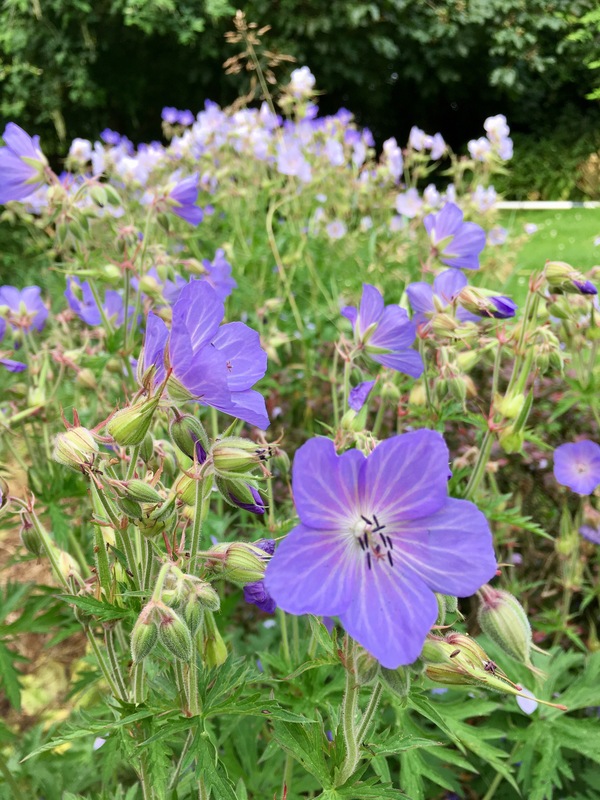 I’m a big fan of hardy geraniums – these are all beautiful. My mother-in-law really disliked what she called the ‘purple flowered bushes’ opposite one another at the top of her path. I thought the flowers were quite striking, however, I think if Ma-in-law had experienced the pleasures of the the pretty pinks or your white, she would have been very happy. I love them too and I love how they hybridise and give you unexpected beauties. So delicate in comparison to the window box type! Lovely photos. I have a weakness for scented leaf geraniums. Lucky you to have these beauties rather than weeds drifting in! Always a joy when the bees ans seed produce a new gem. Kathy Mother Nature sometimes rewards us with wonderful things. He has touched these beautiful Wild Geraniums, each one more beautiful. Greetings from Margarita. I m planting more of these reliable beauties.